“I live in a no-man’s land. I live in a land that is occupied by the Sinaloa drug cartel,” he sighed, pointing to mountains on his ranch where he said scouts equipped with sophisticated equipment are posted as lookouts for smugglers. To many, Donald Trump’s pledge to build a wall along the US-Mexico border is unrealistic. But for Jim Chilton, it’s the only way he’ll get a good night’s sleep. 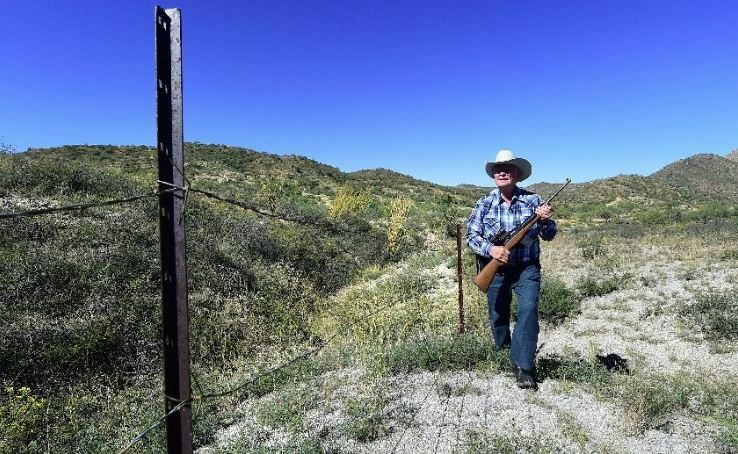 The 77-year-old, a fifth-generation rancher on the Arizona border with Mexico, says he has grown weary of seeing drug smugglers — rather than just cattle — on his ranch and a wall is the answer to his troubles. “I really admire Trump for having the insight and the knowledge to know what’s wrong with the current border system,” he said, as he surveyed the sprawling desert plains of his 75-square-mile ranch that stretches to the Mexican border. The Republican US presidential candidate has made building a wall along the southern border a staple of his campaign and has said the structure would cost $8-12 billion, with Mexico footing the bill. He has also pledged to deport some 11 million people who are in the country illegally. Chilton, who admits that Trump was not his first choice among the Republican candidates for the White House, says building a barrier to secure the 2,000-mile (3,200-kilometer) US-Mexico frontier not only makes sense but is also a question of national security. Chilton — who keeps a gun holstered on his hip, a rifle by his front door and a pistol by his bedside — added that he and other ranchers are also in favor of beefed up security in remote border areas as extremist groups like Islamic State (IS) may be using them to slip operatives into the United States. “We have no idea on this porous international boundary how many people from IS are actually coming in,” he said, standing by the four-strand barbed wire fence on his ranch. “It could be awful, it could be horrible. Although several US politicians have claimed that members of the jihadist group were present in Mexico and had crossed into the US through the southern border, authorities have said there was no actual evidence of that. But beyond the drug cartels and threat of terrorism, Chilton insists that Trump’s wall is all the more necessary for humanitarian reasons. “It’s just outrageous for me to find a dead body on my ranch. It’s outrageous for the border patrol to find a dead body and it’s outrageous for my cowboys,” he said, referring to migrants who often die making the crossing into the US through the brutal desert. He said he always carries at least 10 gallons of water in his pick-up truck in the event he runs into desperate migrants, but in recent years their numbers have dwindled as drug cartels took control of the border area. According to the US Border Patrol, nearly 2,600 bodies have been recovered since 1998 from the desert in the Tucson, Arizona sector which covers 262 miles of the border. But groups that work closely with migrant issues in that area say they doubt the number of casualties will decline if a wall is built. They point to the 652 miles of fencing and related infrastructure that already exist along the US-Mexico border as an example of why a barrier — however tall and solid — will not deter people from trying to illegally enter the US. “A fence by itself will do absolutely nothing if you don’t have somebody watching it all the time,” said Mike Kreyche, a member of Tucson Samaritans, a humanitarian group that drops water and food along migrant trails in the desert. “I think the biggest thing missing from this conversation about migrants is looking into the root causes,” he added.